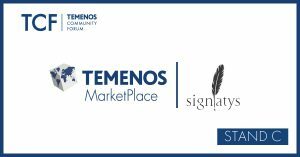 Every year, Temenos organizes its annual global event called Temenos Community Forum(TCF). This event is attended by over 1600 senior executives from banks, financial institutions (including start-ups), investors, analysts and media globally. It is a platform where we encourage dialog amongst these different parties about the future of banking, addressing the increased pressures that banks experience when it comes to maintaining customer loyalty while adhering to the requirements from the regulators. In its 20th year, it has become one of the largest banking and financial conferences in the world.